Counting Crows in Brussels, 2008. L to R: Bogios, Duritz, Immerglück, and Gillingham. Vickrey is cut off at the left, Powers is behind Duritz, and Bryson is out of frame. Counting Crows was nominated for two Grammy Awards in 1994. The band also received a 2004 Academy Award nomination for "Accidentally in Love", which was included in the film Shrek 2. The band's influences include Van Morrison, R.E.M., and Bob Dylan. The band name was taken from One for Sorrow, a British divination nursery rhyme about the superstitious counting of magpies (which are members of the crow family). Singer Adam Duritz heard the rhyme in the film Signs of Life, which starred his close friend, actress Mary-Louise Parker. The rhyme is featured in the song "A Murder of One" on the band's début album, August and Everything After. Adam Duritz, former member of the San Francisco Bay Area band The Himalayans, and producer/guitarist David Bryson formed Counting Crows in San Francisco in 1991. They began as an acoustic duo, playing gigs in and around Berkeley and San Francisco. Another friend, guitarist David Immerglück, played with them from time to time, though he was not an official member of the group, and experimented with other musicians in the area. As the emerging band recorded some demos, and as other musicians joined the duo to make a full band, Immerglück recorded with the band on some of the songs for their first album. He declined joining the band at the time, because of his membership in two other locally popular bands, Monks of Doom and Camper Van Beethoven. By 1993, the band had grown to a stable lineup of Duritz as vocalist, occasional pianist, and primary songwriter, Bryson on guitar, Matt Malley playing bass guitar, Charlie Gillingham on keyboards, and Steve Bowman as drummer, and the band was a regular in the Bay Area scene. The same year, the band signed to Geffen Records. On January 16, 1993, the band, still relatively unknown, filled in for Van Morrison at the Rock & Roll Hall of Fame ceremony, and was introduced by an enthusiastic Robbie Robertson. At the ceremony, they played a cover of Van Morrison's "Caravan". Before signing to Geffen, the band recorded demo versions of a number of songs, known as the 'Flying Demos'. These later surfaced among the Counting Crows fanbase. Tracks include "Rain King", "Omaha", "Anna Begins", "Einstein on the Beach (For an Eggman)", "Shallow Days", "Love and Addiction", "Mr. Jones", "Round Here", "40 Years", "Margery Dreams of Horses", "Bulldog", "Lightning", and "We're Only Love". Some songs from the tape later resurfaced (in reworked versions) on the band's debut album August and Everything After. From the beginnings, Counting Crows focused on live performances. The band's debut album August and Everything After, produced by T-Bone Burnett, was released in September 1993. The band toured extensively in 1993 and 1994, both as headliners and in supporting roles with other artists, including The Rolling Stones, Cracker, the Cranberries, Suede, Bob Dylan, Los Lobos, Jellyfish, and Midnight Oil. The first single, "Mr. Jones", refers to The Himalayans' bassist, who was Duritz's childhood friend, Marty Jones, and Kenney Dale Johnson, the drummer of Silvertone, Chris Isaak's band, describing the desire of working musicians to make it big and the fantasies they entertain about what this might bring. Duritz sang the song in fun, enjoying the fantasy of making it big. However, he did not realize that just months later, in December 1993, MTV would begin playing the video for the song. It was an unexpected hit song, drawing massive radio play and launching the band into stardom. August and Everything After became the fastest-selling album since Nirvana's Nevermind. 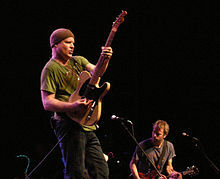 With their first single propelling the band forward, and positive reviews from Rolling Stone and other publications, it was decided that the band could use a second guitarist, and Dan Vickrey, another Bay Area musician was offered the role as lead guitarist, singing backing vocals. In 1994 the band appeared on Saturday Night Live and Late Show with David Letterman, and toured with The Rolling Stones. The album sold 7 million copies, but success took a toll on the band; drummer Steve Bowman left, and Duritz suffered a widely reported nervous breakdown, which was not his first. The band played only two gigs in 1995. This allowed Duritz to write a set of songs that became the band's second album, Recovering the Satellites. Released October 15, 1996, it was heavier than August and Everything After, perhaps due to the addition of second guitarist Dan Vickrey, who had joined in early 1994. A response to the sudden fame that "Mr. Jones" had brought, it contains lyrics such as "These days I feel like I'm fading away / Like sometimes when I hear myself on the radio" (from "Have You Seen Me Lately?") and "Gonna get back to basics / Guess I'll start it up again" (from "Recovering the Satellites"). Dealing with the theme of Duritz's unease with his newfound fame, the album was described as "a concept album of sorts about trying to pick up the pieces of a family, a social life and a psyche shattered by fame". This album contained the hit single "A Long December" which received medium to heavy FM airplay. On July 2, 1997, Counting Crows kicked off a co-headlining tour with The Wallflowers that continued through September. This tour included opening acts by Bettie Serveert, Engine 88, Gigolo Aunts, and That Dog, with each opening band touring for a three-week stretch. After nine months of near-constant touring in support of the album, Duritz developed nodules on his vocal cords in July 1997, leading to the cancellation of a number of gigs. After taking time off to recover, the band toured for the rest of 1997, concluding with a show at the Hammerstein Ballroom, New York. This concert was released as half of a double live album Across a Wire: Live in New York City. The other disc was a recording of a predominantly acoustic set from the band's appearance on the VH1 Storytellers show. In 1999, Counting Crows performed at Woodstock 99. Later that same year, the band released This Desert Life, sales of which were propelled by the success of "Hanginaround" and "Colorblind," which was also featured in the movie Cruel Intentions. Supporting the album, the band embarked on a co-headlining tour with alternative rock band Live. Counting Crows closed nearly every show. Before this album and subsequent tour, the band invited session player and long-time friend David Immerglück to join the band as a permanent member. Immerglück had played on every Counting Crows album as a sideman, but early on had declined a permanent position. This time, however, Immerglück said yes and now plays variety of instruments with the band, including acoustic, electric, and pedal steel guitars, slide guitar, and mandolin, as well as contributing backing vocals. On July 9, 2002, the band released their fourth studio album, Hard Candy. The album included a cover of Joni Mitchell's song "Big Yellow Taxi". Vanessa Carlton contributed backing vocals to the single edit of the track, which appeared on the soundtrack for Two Weeks Notice and was re-released on future Hard Candy albums. The original version, without vocals by Carlton, appeared on the first album release as a hidden track. Hard Candy received better reviews than the previous efforts, with "radio friendly" songs, like "American Girls" (which featured Sheryl Crow on backing vocals), and contains a more upbeat feel and tempo. The band toured with the Dutch band, Bløf. A song, "Holiday in Spain", came together as a result of the camaraderie between the two groups: it is sung partly as a dual language duet, and partly as a musical "round", with both lead singers singing in differing languages at the end of the song. Midway through the Hard Candy tour, drummer Ben Mize (born February 2, 1971, Durham, North Carolina) amicably left the band to spend more time with his family and pursue his own musical interests. 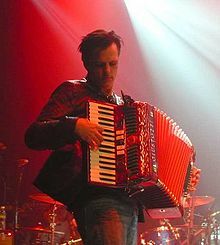 After Mize completed the American leg of the tour, he was replaced by Jim Bogios, formerly a drummer with Ben Folds and Sheryl Crow. Jim attributes leaving Sheryl Crow for Counting Crows to becoming a band member and having more creative input. 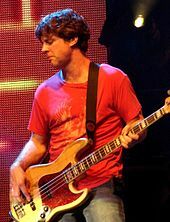 Following the Hard Candy tour, longtime bassist Matt Malley left the band. He was replaced by Millard Powers. 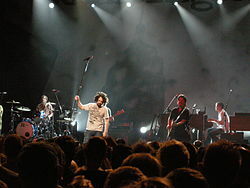 Counting Crows released the greatest hits album, Films About Ghosts in November 2003; the album title was taken from the lyrics of "Mrs. Potter's Lullaby", which appeared on This Desert Life. The band also toured in 2003 with John Mayer, in 2003 and 2008 with Maroon 5, and in 2002 and 2004 with the Graham Colton Band. In 2004, the band's "Accidentally in Love" appeared on the soundtrack of the hugely popular computer-animated film Shrek 2. The song was nominated and performed for an Academy Award, and later versions of the 2003 greatest hits album include the track, which was re-released in 2004. The official film clip of the song features LA-based international model Steve Vanda. In June 2006, the band released New Amsterdam: Live at Heineken Music Hall, a live album assembled from performances on their 2003 tour in support of Hard Candy. Although it is composed mainly of performances of already released material, it also contains "Hazy" (co-written with tour support act Gemma Hayes) and various vendor-specific additional tracks, such as a cover of Jackson C. Frank's "Blues Run the Game". Duritz hinted in a 2006 interview that Counting Crows' next studio record would be released in late 2007. He indicated that the band had spent three weeks working in a recording studio with Gil Norton, the producer behind Recovering the Satellites, and revealed the working title of the album to be Saturday Nights & Sunday Mornings. Duritz explained that "Saturday night is when you sin and Sunday is when you regret. Sinning is often done very loudly, angrily, bitterly, violently." Vickrey stated that "the idea at the moment is to have kind of a rocking side and then an acoustic-y, maybe country-ish side. We got the first half done in May in New York, so half of it is pretty strong and done. And now we're going to work on the second half, the country tunes, during the tour." Amidst touring in July 2007, the band performed live before the Home Run Derby at the 2007 MLB All-Star Game, and on July 22 previewed two new songs at Daniel S. Frawley Stadium in Wilmington, Delaware, a new ballad titled "Washington Square" and a hard rocking track called "Cowboys". On August 8, 2007, VH1 filmed a live performance of "Mr. Jones", clips of which were shown on the miniseries 100 Greatest Songs of the 90s. The song ranked No. 27 on the list. In September 2007, Counting Crows played a unique show at Town Hall in New York City, during which they performed all tracks from August and Everything After in album order. The show was recorded for a planned DVD release, and also featured several songs from the new album. On September 27, Duritz announced on his blog that the band had asked its record label to postpone the album's release until early 2008, citing the time pressures involved in preparing both the new album and an August and Everything After deluxe edition for release. On January 16, 2008, the band released a digital single on their official website as a free download. It featured "1492" from the "Saturday Nights" half of the new album, and "When I Dream Of Michelangelo" from the "Sunday Mornings" half as its B-side. The album was released on March 25, 2008. In support of the release, Counting Crows performed on The View, Good Morning America, and The Howard Stern Show in March; A&E Private Sessions, The Late Late Show with Craig Ferguson, and The Late Show with David Letterman in April; and again on Good Morning America in May, this time from a live concert in Bryant Park. In 2008, Virgil Griffith, a software application writer, conducted a study in which he took the ten highest "favorite music" options from Facebook for 1,352 different colleges, and cross-referenced them with the average SAT score from each college. Counting Crows turned out to be near the top, along with such artists as Sufjan Stevens, Guster and U2. On March 22, 2009, Duritz announced on the band's website that the band would be leaving Geffen Records, with whom they had worked for 18 years. On this day a message from Duritz himself was posted on the band's homepage: a second message was posted a few weeks later. He ended the first letter with a free download of the band's cover of Madonna's "Borderline." The track was recorded live at the Royal Albert Hall in 2003. Following the departure from Geffen, the band has continued to tour. During the summer of 2009, they launched the ambitious Saturday Night Rebel Rockers Traveling Circus and Medicine Show tour with longtime Bay Area friend Michael Franti, his band Spearhead, and the band Augustana. Instead of the traditional concert format of a short set by an opening act, followed by a longer set from a main supporting act, and then a long set by the headlining band, the shows featured members of all of the bands joining each other for songs from each bands' catalogs at various points throughout the evening. As Duritz explained in a welcoming message on the official website for the tour, each show "is going to start with EVERYONE onstage together and we're going to all be running on & off stage all night playing one each other's songs all together and basically just playing whenever we feel like playing." The success of the first tour spawned a second in the summer of 2010 with Counting Crows and Augustana joined by rock/hip-hop artist (and formally trained jazz trumpeter) NOTAR, whom Duritz had signed to his independent Tyrannosaurus Records label, in place of Franti & Spearhead. At the conclusion of the second Traveling Circus tour, Duritz returned to his home in New York City while the other band members retreated to California. Various members began work on individual projects. Duritz has shared solo recordings and musical cover songs online, including the 7-song EP All My Bloody Valentines recorded in February 2011, as well as his progress with recovery from several prescription drug addictions. Vickrey and Bogios recorded the self-titled debut album for their side project, The Tender Mercies, a band with roots going back to the early 1990s. The album was released on October 24, 2011. The long-awaited release of August and Everything After: Live at Town Hall on August 30, 2011 marked the band's third professionally produced live album and the first concert video of their career, using footage from the Town Hall concert recorded in September 2007. The band also returned to the studio in the spring of 2011 to record a number of cover songs with the intention of releasing a full-length album, an idea Duritz first began publicly speaking of following the release of Saturday Nights and Sunday Mornings. Duritz confirmed, while on tour with the band and through social media in the fall of 2011, that they were in the process of mixing over 20 songs and that an album of the covers would be released in the spring of 2012. The covers album, Underwater Sunshine (Or What We Did On Our Summer Vacation), was originally announced on December 14, 2011, with a planned release on March 27, 2012. The band recorded versions of songs by Travis, The Romany Rye, Dawes, Sordid Humor, Madonna, Big Star, Kasey Anderson & the Honkies, Gram Parsons, Joe Jackson, the Faces, and Stereophonics, amongst others. It was eventually released on April 10, 2012, with a cover design by a fan chosen in a promotional contest. After touring extensively in 2012 and 2013 in support of the album, including headlining The Outlaw Roadshow, a traveling festival tour presented by the band in conjunction with Ryan Spaulding of the music blog Ryan's Smashing Life, and a summer 2013 North American tour with The Wallflowers, the band began working on material for a new album. Duritz also took time in the summer of 2012 to begin co-writing a play called Black Sun, which will also feature some music written by Duritz, including well-known rarity songs "Good Luck" and "Chelsea". In addition to touring, a number of live recordings for the music discovery website Daytrotter soon followed. A four-song session was released on the site in April 2012, with a second session recorded in July 2012 but released on the site the following July. A top-billed performance at the site's Barn on the 4th celebration concert at Iowa's Codfish Hollow Barn on July 4, 2012, was also released through the site on video and digital download. A live album, Echoes of the Outlaw Roadshow, was released in April 2013. Culled from various performances throughout the previous year's festival tour, the album was released in different fashions throughout various markets. Available for direct sale in the UK market, Echoes was offered as an incentive for purchasing Underwater Sunshine in the Australian market. In North America, Echoes was given away as a digital download with the purchase of tickets to the summer 2013 tour. The album was given an official retail release in North America in November 2013. Writing of material for a new album, Somewhere Under Wonderland, began early in 2013 and continued during that year's summer tour. Duritz, Powers, Vickrey, and Immerglück got together in New York City that August for a 10-day writing session during which they wrote six songs. The first song written for the new record was "God of Ocean Tides". Expecting to go into the studio in late fall 2013, the band began recording for the new album in early December and finished in February 2014. The group signed with Capitol Records to distribute the album with a scheduled release on September 2, 2014. Lead single "Palisades Park" was released on July 8, 2014. In January 2019, they released a newly recorded version of "August and Everything After" performed with the London Symphony Orchestra at Air Studios. The song was the title track from their first album that was originally cut. The track was originally debuted on the Underwater Sunshine podcast and then release exclusively to Amazon Music. Counting Crows, and Adam Duritz in particular, have become renowned for the energetic, passionate nature of their live performances. Duritz frequently extends and rewrites songs live, adding extra verses or alternate middle sections and/or endings, sometimes fitting most of another of the band's other songs into the middle of the first. On a live performance on Howard Stern's Sirius broadcast radio show, he delivered an altered version of "'Round Here" that Stern said was one of the best performances in his studio he had ever heard, with anchor Robin Quivers agreeing. He often uses other artists' lyrics in these sections as well, ranging from well-known acts, such as Bruce Springsteen, Van Morrison and George Gershwin, to obscure Bay Area bands, including revisiting material from his days working with Sordid Humor. Most songs have been altered at some point during the band's history; the ones most often subjected to this treatment include "Round Here", "Goodnight Elisabeth", "Rain King", and "A Murder of One". Examples of this can be heard on the MTV Live at the 10 Spot disc from Across a Wire: Live in New York City (on which "Round Here" contains lyrics from "Have You Seen Me Lately?") and the VH1 Storytellers disc ("Anna Begins" has an extended midsection with new lyrics, and the introduction to "Mr. Jones" includes lyrics from "Miller's Angels" and from The Byrds' "So You Wanna Be A Rock & Roll Star"). Fansites have attempted to keep records of these alternate lyrics, or "alts". The band has also become known for its acoustic performances, most notably recorded on the VH1 Storytellers disc from Across a Wire: Live in New York City. In addition, as of Fall 2010 (and maybe earlier), the band has recorded Coffee Covers for Sirius-XM Radio Channel-51 ("The Coffee House"), including a cover of The Ghost in You (Psychedelic Furs). iTunes Live from SoHo was recorded on March 27, 2008, at an in-store performance in the SoHo Apple Store in New York City. The album was an iTunes exclusive. It featured many songs from the band's 2008 release Saturday Nights and Sunday Mornings along with old favorites such as "Rain King" and "A Long December". The band has drawn deep in covering artists such as Otis Redding, George Harrison, Wilco, Teenage Fanclub, Rod Stewart, Fairport Convention, Pure Prairie League, The Rolling Stones, Jackson C. Frank, Bob Dylan, Jackson Browne, Grateful Dead, Joni Mitchell, Warren Zevon, Bruce Springsteen, U2, Simon and Garfunkel, Psychedelic Furs, Oasis and The Band. In 2008 the band launched a new website, offering band-approved, soundboard-quality recordings of its concerts. In February 2011 Duritz released an indie album of cover songs he had recorded entitled All My Bloody Valentines, in which he allowed Facebook followers to help name and design the cover art for the album. The album is allowed for free download on Duritz's soundcloud webpage. Duritz later announced that the band has continued recording a new album as an independent band. The album August and Everything After: Live at Town Hall was released on August 29, 2011. The band actively encourages the recording of its concerts and the distribution of the resulting bootleg recordings (though the tapers who create the recordings eschew such terminology on account of its association with unauthorized creation and its tendency to imply that the taper has black-market commercial intentions: see "Taper (concert)"). The band hosts a trading network on its website to enable fans to swap concert recordings. Sale of fan recordings for profit is prohibited; fans must either trade their own recordings for others or pay for blank media, postage, and packaging. An unofficial torrent site, named Crowstown, offers a vast quantity of video and live audience recordings for free. ^ Rubenstein, Jullian. When Fame Glows Bright, It's Hard to Be Tortured. The New York Times. December 1, 1996. ^ "Counting Crows following a logical path in recordings". Canada.com. Archived from the original on September 9, 2014. Retrieved October 5, 2014. ^ "Bio". Official Counting Crows website. Live Grey Bird Foundation. 2008. Retrieved January 14, 2009. ^ Kaufman, Gil. Jamie Foxx Gets Two Oscar Nods, 'Aviator' Leads Pack. MTV.com. January 5, 2005. ^ "Rolling Stone Article -June 30, 1994". monmouth.com. June 30, 1994. Archived from the original on February 24, 2008. Retrieved February 28, 2008. ^ a b Erlewine, Stephen Thomas (2005). "Counting Crows biography". VH1.com. Archived from the original on April 2, 2007. Retrieved March 1, 2007. ^ "Counting Crows are Riding High". Vox.com. December 11, 2002. ^ Kot, Greg (2004). "Counting Crows: Biography". Rollingstone.com. Retrieved March 1, 2007. ^ a b c d e f "The Biggest New Band In America". Rolling Stone. June 30, 1994. Archived from the original on November 15, 2006. Retrieved March 1, 2007. ^ "Lisa's Counting Crows Shrine". Anna-begins.com. Retrieved March 29, 2012. ^ P. Tate, Flights of Fancy: Birds in Myth, Legend, and Superstition (New York: Random House, 2010), ISBN 1409035697. ^ "Toledo Blade – Google News Archive Search". News.google.com. Retrieved October 5, 2014. ^ a b c Farley, Mike (2003). "Interview with David Immerglück of Counting Crows". Bullz-Eye.com. Retrieved March 1, 2007. ^ a b "CountingCrows.com Gig Archive". CountingCrows.com. Archived from the original on February 10, 2007. Retrieved March 1, 2007. ^ "Adams Blog". countingcrows.com. Retrieved October 23, 2009. ^ "BB Chronicles: Counting Crows – 1991 – Flying Demos". Bbchron.blogspot.com. November 29, 2009. Retrieved March 29, 2012. ^ "Interview with Drummer Kenney Dale Johnson". Blogcritics Magazine. Archived from the original on October 12, 2007. Retrieved June 17, 2007. ^ "We're gonna be big stars". Rollingstone.com. October 31, 2005. Archived from the original on January 8, 2007. Retrieved March 1, 2007. ^ a b Greenstreet, Rosanna (February 15, 2003). "Q&A: Adam Duritz". The Guardian. Retrieved March 1, 2007. ^ a b "Steve Bowman – About Steve". stevethedrummer.com. Archived from the original on February 28, 2007. Retrieved March 1, 2007. ^ a b c Strauss, Neil (October 15, 1996). "Stars Come Out From Under". The New York Times. Retrieved March 1, 2007. ^ "Duritz Needs To Rest Voice". RollingStone.com. July 25, 1997. Archived from the original on October 2, 2007. Retrieved March 1, 2007. ^ "Counting Crows Counted In Again". Retrieved March 12, 2017. ^ Farber, Jim. Free As A Bird Counting Crows' Live Double Album Plays Faster And Looser. New York Daily News. August 2, 1998. ^ Farber, Jim. WOODSTOCK: HURTS SO GOOD LOUD BANDS, MELLOW FANS & THE JOY OF MISERY[permanent dead link]. New York Daily News. July 26, 1999. ^ "Mercury News: Search Results". Nl.newsbank.com. Retrieved October 5, 2014. ^ "BLOF en Counting Crows samen op concert at SEA [Blik op Nieuws.nl – Glossy]". Blikopnieuws.nl. Retrieved March 29, 2012. ^ "Counting Crows are Riding High". Vox.com. December 11, 2002. Archived from the original on September 22, 2007. Retrieved April 22, 2007. ^ "Counting Crows". IMDB. Retrieved March 1, 2007. ^ Mar, Alex (January 25, 2005). "Crows Nab Oscar Nom". RollingStone.com. Retrieved March 1, 2007. ^ a b Benson, John (June 20, 2006). "New Counting Crows: One Part Rock, One Part Country". Billboard. Archived from the original on September 28, 2007. Retrieved March 2, 2007. ^ Weiner, Ben (July 2, 2006). "Counting Crows: Rearranged, revealing, riveting". Orange County Register. Retrieved March 2, 2007. ^ "Pre-Derby tunes a home run". Major League Baseball. Retrieved October 5, 2014. ^ "VH1 picks 100 greatest songs Let the 5-part countdown, bickering begin". Pqasb.pqarchiver.com. Retrieved October 5, 2014. ^ "Recounting Crows: Adam Duritz's dark secret". Readingeagle.com. Retrieved October 5, 2014. ^ "Saturday Nights And Sunday Mornings". Amazon.ca. Retrieved May 9, 2009. ^ "U.S. Study Reveals the 'Musicthatmakesyoudumb'". exclaim.ca. ^ "Counting Crows Part Ways With Geffen". March 22, 2009. Retrieved May 9, 2009. ^ "Traveling Circus and Medicine Show 2009 Summer Tour Promo". YouTube.com. July 13, 2009. Retrieved October 30, 2011. ^ "Traveling Circus and Medicine Show – Counting Crows, Michael Franti and Spearhead, and Augustana Official Tour Page". Travelingcircusshow.com. Archived from the original on April 25, 2012. Retrieved March 29, 2012. ^ "Artist Bio: NOTAR". TyrannosaurusRecords.net. Retrieved October 30, 2011. ^ "Biography". Facebook – Tender Mercies. Retrieved October 30, 2011. ^ "Check Out Tender Mercies". CountingCrows.com. October 21, 2011. Archived from the original on October 24, 2011. Retrieved October 30, 2011. ^ "Counting Crows – Live!". Eagle Rock Entertainment. July 15, 2011. Archived from the original on September 27, 2011. Retrieved October 30, 2011. ^ "Twitter Update: October 20, 2011 8:15am". Twitter.com. Retrieved October 5, 2014. ^ "Twitter Update: October 20, 2011 8:19am". Twitter.com. Retrieved October 5, 2014. ^ "Just to remind everyone..." Facebook – Counting Crows. Retrieved December 14, 2011. ^ a b "Be a part of Counting Crows' future..." Facebook – Counting Crows. Retrieved December 14, 2011. ^ "Twitter Update: October 20, 2011 8:38am". Twitter.com. Retrieved October 5, 2014. ^ "Twitter Update: October 20, 2011 8:44am". Twitter.com. Retrieved October 5, 2014. ^ "Twitter Update: October 20, 2011 8:51am". Twitter.com. Retrieved October 5, 2014. ^ "Twitter Update: October 20, 2011 8:55am". Twitter.com. Retrieved October 5, 2014. ^ "Twitter Update: October 20, 2011 8:56am". Twitter.com. Retrieved October 5, 2014. ^ "Design an Album Cover for Counting Crows". Creative Allies. Archived from the original on January 3, 2012. Retrieved December 14, 2011. 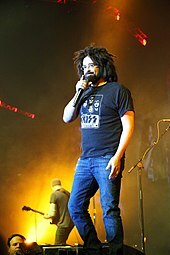 ^ "Reddit: I am Musician Adam Duritz from Counting Crows. Ask me anything..." Reddit. July 30, 2013. Retrieved September 6, 2013. ^ a b "MSN Exclusives: Counting Crows". MSN Canada. June 26, 2013. Retrieved September 6, 2013. ^ "Counting Crows – April 19, 2012: So You Know There Will Be Treatment". Daytrotter. April 19, 2012. Retrieved September 6, 2013. ^ "Counting Crows – July 5, 2013: When The Sun Came Shining". Daytrotter. July 5, 2013. Retrieved September 6, 2013. ^ "Counting Crows – July 4, 2012: Barn on the 4th (Video)". Daytrotter. July 4, 2012. Retrieved September 6, 2013. ^ "Lisa's Counting Crows Shrine". Annabegins.com. Retrieved August 16, 2011. ^ Counting Crows (August 1, 2008). "Live Counting Crows". Official Counting Crows Website. Retrieved January 5, 2009. ^ WSJ Staff. "Adam Duritz Names Winner of All My Bloody Valentines Cover Contest". WSJ. Retrieved October 5, 2014. ^ "Counting Crows". Facebook. Retrieved August 16, 2011. ^ "August and Everything After: Live at Town Hall – Counting Crows – Songs, Reviews, Credits – AllMusic". Retrieved March 12, 2017. ^ "The Counting Crows Trader Network – According to Mr. Jones". Countingcrowsdb.com. Archived from the original on October 3, 2011. Retrieved August 16, 2011. ^ "CrowsTown Live Music Sharing". Crows-town.com. Retrieved March 21, 2010.